Thank you so much YABC for revealing my cover! 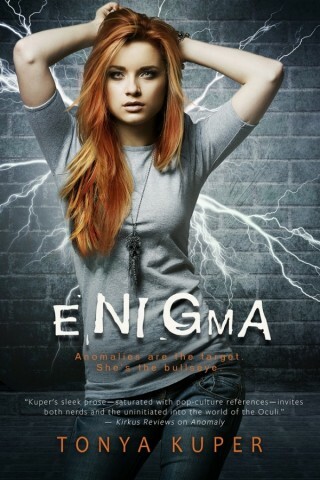 I’m so excited about Enigma releasing in July! And the cover for Enigma is AMAZING! I think it’s cool how the lighting and tone of the cover is altered from Anomaly’s cover, which echoes my thoughts on the entire sequel. 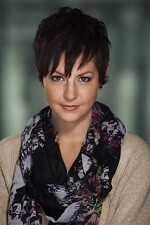 Fans will get to see scifi nerd Josie and Reid in a different light. We get to know them on a deeper level. Josie will show off her brains and guts, while Reid gives us a peek of his vulnerable side. Plus, Josie is standing on this cover – she’s ready to fight. She shows us in Enigma that young women are complex. She can simultaneously be feminine, nerdy, and tough. 1 winner will receive an eARC of Enigma once the files are available + a signed copy of Anomaly. I'm loving the cover, and the girls hair ? Kudos to the cover and the synopsis-writer! I am intrigued! I love the cover--she looks tough and smart, just like the character described in the synopsis. I think this character has a great sense of humor--I love the sarcasm!! I love the lightning bolts on the cover. The cover conveys the excitement of the story.